Bio Notes: Ewan Christian was born in Marylebone, London, on 20 September 1814, the seventh of the nine children of Joseph Christian and his wife Katherine Scales of Thwaitehead, Lancashire. The Christians were a landed Manx family who had held office as Deemster on a near-hereditary basis. Christian’s branch of the family also owned Ewanrigg in Cumberland. His father and mother died in 1821 and 1822 respectively. He was thereafter brought up by his elder brother John. Christian’s education and professional training – for which his brother was subsequently repaid as a matter of principle – reflected the well-off family background. Originally intended for the church, he was educated at Christ’s Hospital, Hertford, in 1823-29. In the latter year he was articled to Matthew Habershon, becoming a life-long friend of his fellow pupil James Kellaway Colling. While at Habershon’s he made sketches for Habershon’s ‘Ancient Half-timbered Houses of England’ and obtained admission to the Royal Academy Schools. In 1834 he travelled on the Continent and on his return assisted the obscure W J Turner with his competition design for the Houses of Parliament. 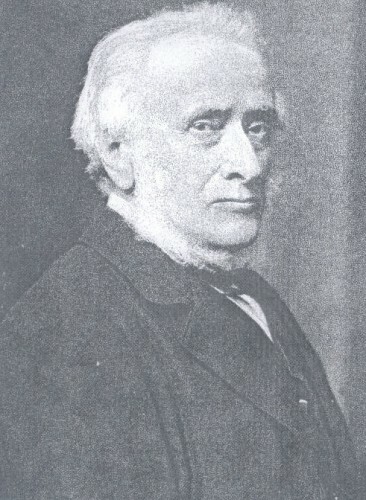 From early 1836 he was assistant to William Railton who was to become architect to the Ecclesiastical Commissioners in 1838, but broke his service there to make a study tour of Italy in 1837; and shortly thereafter he moved to the Norwich office of John Brown where he and Colling were again colleagues. excellent drawings by Colling, and by coming second to John Gibson in the 1847 competition for the Imperial Assurance Buildings in London. With the practice now well established, he married Anne Bentham, a relative of Jeremy Bentham, on 6 July 1848 and set up houses at 6 Eton Villas, Hampstead. On 2 December 1850 Christian was advanced to FRIBA, his proposers being Samuel Angell, Benjamin Ferrey, Scholes and Thomas Henry Wyatt; and in the following year he was appointed architect to the Ecclesiastical Commissioners, Railton’s tenure of that office having ended in 1848. This appointment resulted in him eventually building some ninety new churches, restoring and adding to 1,300 others and designing a large number of parsonage houses, but it also resulted in a serious breakdown in health with erysipelas in 1874. His Manx cousin Joseph Henry Christian – always known as Henry Christian – and his principal assistant Charles Henry Purday were taken into partnership, although the practice was to remain in Ewan Christian’s name only. As architect to the Ecclesiastical Commissioners, Christian assessed a large number of competitions, mostly for churches. In the summer of 1872 the Walker Trustees invited him to report on the designs submitted for St Mary’s Cathedral, Edinburgh, the first of the three major competitions with which he was involved. It was a limited competition and two of the three English invitees, George Edmund Street and William Burges were personal friends. His very detailed report made no recommendation, but a preference for Street’s wide-span scheme was indicated. In 1884 he was one of the assessors for the War Office and Admiralty competitions; in 1887 he was sole assessor in that for the new cathedral at Liverpool where the recommended design by Sir William Emerson remained unbuilt, and in Scotland for the Thomas Hope Hospital at Langholm where his award to his former assistants Woodd and Ainslie in 1894 was also the subject of comment. Christian’s own practice was conducted at two levels: cathedral restorations (Southall from 1851 and Carlisle from 1853) and high-quality churches in the manner of Street and Teulon from well-off congregations on the one hand and cheap churches built to the budgetary requirements of the Ecclesiastical Commissioners on the other. Probably because of his travels in Italy, which continued into his later years, he differed from his church-building contemporaries in not having any exclusive allegiance to gothic. He retained an interest in Italian Renaissance and his major mid-career country houses, notably Market Lavington, 1865, were Old English influenced by Devey’s. Later, from about 1880, he was to adopt the Nesfield-Godwin manner with tall-hipped roofs and stacks, his own Thwaitehead, Hampstead, incorporating Anglo-Japanese details. In person Christian was a strict low-church evangelical, firm to the point of arrogance and a stickler for sound construction, known to tear down bad work with his own hands. Nevertheless he enjoyed the friendship of most of the leading members of the profession whatever their personal habits or beliefs. Among them were John Loughborough Pearson who married Christian’s cousin Jemima; William Burges, despite his addiction to opium; and Devey who belonged to the Voysey Theistic church. Together with Street, they all made a study tour of France, Belgium and Holland at a still untraced date in the later 1870s. This wide circle resulted in Christian becoming Vice-President of the RIBA in 1880, PRIBA in 1884-86, and Royal Gold Medallist in 1887. In the same year, 1887, he was appointed architect to the Charity Commissioners, his main work for them being a comprehensive survey of the Wren churches then still surviving in the City of London. In 1889 William Henry Alexander, donor of the National Portrait Gallery, specified Christian as its architect. At the suggestion of Sir Frederick Burton, director of the National Gallery, Christian made a study tour which embraced Bruges, Ghent, Antwerp, Amsterdam, Berlin, Frankfurt, Kassel and Dresden in the autumn of that year. These travels resulted in a very sophisticated scheme which faultlessly extended William Wilkins’ National Gallery and provided a completely new Early Renaissance block with a clear identity of its own, but Christian did not live to see its opening in April 1896. In January 1890 he suffered the loss of his daughter Bessie and in November he had to recover from overwork in Cumberland; in May 1892 he again made himself ill, recuperating at Eastbourne; and in February 1895 over commitment again resulted in erysipelas from which he died on the 21st. His wife died later in the same years. Their three remaining daughters, Eleanor, Agnes and Alice survived them.